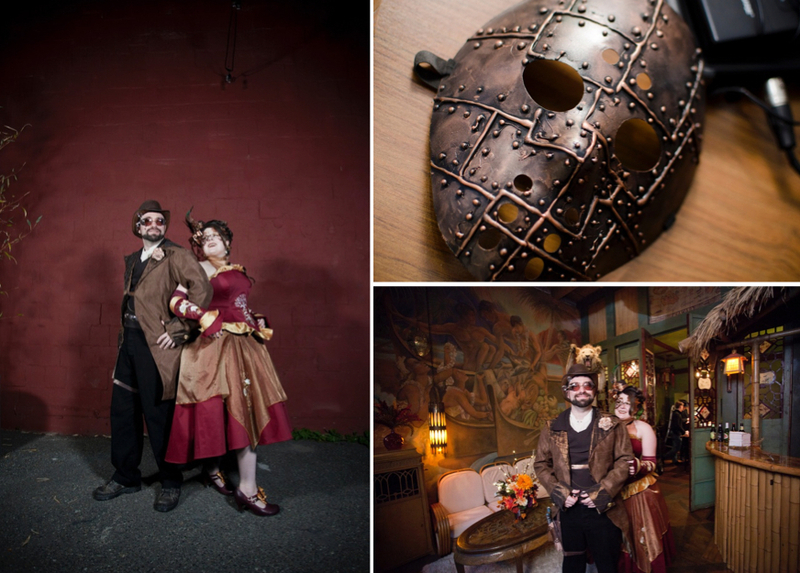 Fantasy Friday ~ A Masquerade, Steampunk, Dragon Cake Kind of Kickass Wedding! Every now and again, I receive a submission on Bitchless Bride that is so outside of what I see and do on a daily basis (uh, my day job as a wedding planner) that I want to jump up and down. Seriously, I feel this wave of AWESOME wash over me, and this is one of those jump up and down times. Although it is not my awesomeness washing over me, it is my awesomeness that is doing the sharing of this unique masquerade, steampunk cool wedding. You see, Heather and Chad had a festive masquerade ball themed wedding at Urban Light Studios. Complete with board games, a rad dragon cake, actors, the four seasons as bridesmaids, and steampunk groomsmen, the night was a lively adventure. Full of fun and unusual details, yet elegant at the same time, Heather and Chad mastered their theme all while embracing the sanctity of marriage. Now how kickass is that? Holy corset! I can't breathe just looking at it, but I LOVE the colors!! Just look at this bunch of bridesmaids and groomsmen!! There is so much to look at in these photographs! The couple stood in a middle of a circle of guests for the ceremony and launched into the first dance, where their family and friends threw leaves onto the dance floor.